StatPlan reports contain many tables, but most reports contain 4 sets of tables, usually globally and analysed by region and country. The different sets of data are calculated with different methodologies. LONG TERM DEMAND CYCLE historically and forward from the current year for 3 to 4 decades. For base power sector data we have constructed databases of installed generating capacity (MW), line lengths for transmission and distribution (km), transformer capacity (MVA), covering every country annually from 1900 to the present day and forecast to 2050. The databases are used both for analysis of power sector parameters and also as bases for component products. For example, we can calculate the number of transmission towers and distribution poles by applying the average numbers of towers or poles per km to the total line length of a network, within voltage level. We have also constructed databases of the installed base of some products in more detail, such as power and distribution transformers by voltage level , in numbers and MVA/kVA capacity. ONE – StatPlan has an overall summation of total capital expenditure on an on-going basis, from national energy agency and utility reports, for generation, transmission and distribution. TWO – Analysis of capex. We have many reports and analyses of expenditure breaking it down into its constituent parts; material, labour, engineering, right-of-way etc., and within product and materials we have detailed segments according to equipment categories. This is analysed and reported in the Power Sector Report Series. From this we can calculate how much of the capex total is taken up by each item of expenditure. THREE – Using different approaches according to the data available we estimate individual market sizes. We use the best data available. It may be manufacturer production data, which we weight up from ex-factory cost to final sale price by adding transport cost and sales distribution mark-ups. Or it may be based on volume sales by unit price. In many markets we have been able to achieve very accurate individual market estimates at this stage. It is important during this process to identify the exact position of the product in the sales chain. For example, electric utilities typically purchase power transformers directly from manufacturers, so the manufacturer’s selling price is the utilities’ purchase price for these transformers. However, distribution transformers go through several additional marketing and distribution steps before the final transformer cost is determined, typically a distributor mark-up of 35% and a contractor materials mark-up of 10%. FOUR – At this stage we have achieved two independent estimates of each market. These are compared and reconciled and any difference between them explained. FIVE – We have several means of validation. In some cases we have comprehensive production and manufacturing data. We have established and tested a set of relationships between different market and product segments. We have established the proportions of overall expenditure which are taken up by individual segments so we can compare one product market with another and check its validity. SIX – Finally, there is one check which should not be discounted, and that is common sense. The experienced eye can sometimes look at a figure and know immediately whether it is right or wrong and evaluate any discrepancies. Having sized the market the next step is to determine short term demand over a five year period and to plot long term demand over a much longer period of years. Short term demand is a basic measurement for marketing planning, while long term demand is a vital factor for strategic planning. The two are quite different measurements of the market. They can conflict and entirely different methodologies are required to assess them. The market will have already been sized as described above. The next stage is to establish how sales will behave over the immediate period of the following few years. This is done by assessing the market factors around it. Products vary in the trends of their sales, some are regular while others are volatile. Some are subject to large short term variations because of major deployments due to a new technology, such as smart meters, when an entire national base may be replaced in a rollout lasting only 4 to 5 years. These rollouts not only disrupt the period while they are carried out but the disruption continues into the future because the replacement period is far less than the service life of the products. What was in the past a steady market will now become subject to extreme peaks and troughs. The market must be assessed in volume and value. Value is not simply volume multiplied by one price. The price can vary every year, determined by over-production or scarcity of capacity and commodity prices. In the past fifteen years these have been very influential factors in electrical markets causiogn major price shifts. The factors affecting the short term market are local, they change and they can only be assessed with local market knowledge. A major factor influencing the markets for electro-technical products is the development of the power sector. This is currently in a state of major change, with the explosion of renewables, the rise of distributed generation and the changes in the traditional generating technologies, such as nuclear, which is being withdrawn in some countries but being actively developed in others. StatPlan has extensive resources in which we track sales of about 60 product fields in generation, transmission and distribution. Demand consists of two elements; new installations and replacement of old installations as they reach the end of their serviceable life. 50 years ago, assets were replaced at the end of their specified design life. In well-run utilities in the industrialised countries perfectly serviceable plant was often taken out and disposed of because that is what the engineering manual decreed and sold as second-hand equipment to utilities in developing countries on tight budgets. Today replacement is condition-based rather than life-time based and refurbishment and retrofit are large industries. The principle is to replace assets when they need to be replaced, not too soon nor too late. StatPlan has constructed a set of databases and models for each year and for every country from 1900 to the present day. Replacement is defined as that amount of capacity in the relevant period which in the case below was installed 40 years ago, and may be replaced, refurbished or retrofitted because it has reached an age of 40 years. The key word is “eligible”. In the long term demand cycle this is the condition of the stock of infrastructure. In the short term what happens may be different as replacements are delayed for one reason or another, usually financial. The amount of capacity eligible for renewal consists of capacity first installed 40 years previously, plus capacity which was installed 80 years ago and renewed 40 years ago, and so on until the entire cycle has been completed. We can plot the historical replacement cycle and also project this into the future. With a replacement cycle of 40 years, in the current year we can forecast the amount of capacity eligible for re-placement 40 years ahead in 2050. We still have to estimate new build and there will always be some uncertainty about the quantity of new capacity which is going to be built, decisions can be changed very quickly. 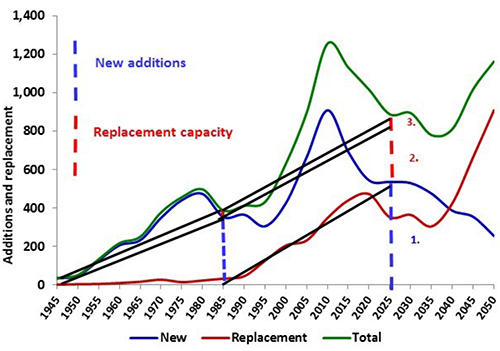 But the amount of capacity eligible for replacement is based on past installations and therefore can be calculated exactly, and it will outnumber new build by a factor of 3 or 4 to 1 by 2050 (see the divergence between the red line (replacement) in the chart below and the blue line (new build). This gives predictions in the future more certainty. The following chart demonstrates the divergence between the growth of installed capacity and annual demand for generating capacity. 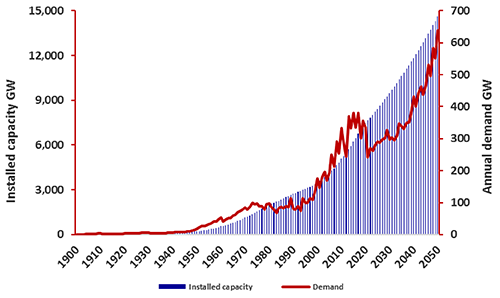 While installed capacity has grown with an almost linear trend for a century, demand has fluctuated to extremes. This has been driven by the periods when installations have surged, with reconstruction after the two World Wars and the consequent impact on the replacement cycle in following years.